With around 207 million speakers and occupying the 7th spot in the list of the world's most widely spoken languages, Bangla is a dynamic language that continues to grow. 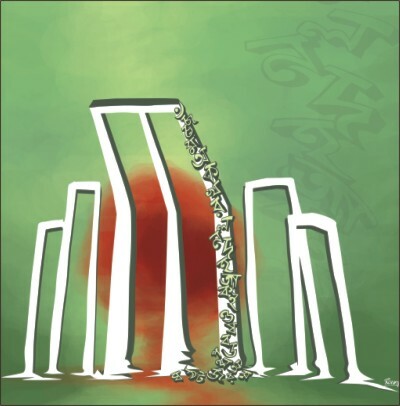 Yet it is one that is not appreciated enough, often sidelined for other foreign languages.We only realize its value during Ekushey February, the International Mother Language Day.The truth, however, is that Bangla is one of the most lyrical languages out there. Proof enough lies in its poetry, songs and proverbs.One who hasn't explored this realm of Bangla hasn't known it at all. I have yet to find another expression of broken hopes which is more well-expressed than Rabindranath Tagore's 'Jaha chai taha bhul kore chai, jaha pai taha chai na'.It expresses exactly the folly of the human mind- running forever behind glory and wanting things which are not meant to be yet disregarding them when they are and running after something else.Then again there is his iteration of 'Iter majhe it, moddhikhane amra manush keet' (i.e. we are all insects residing inside these brick buildings of ours) which gives you a weird sense of claustrophobia and makes you wonder- are we really as helpless as insects?There is the deeply romantic 'Shomaj shongshar miche shob, miche e jiboner kolorob, kebol aakhi diye aakhir shudha piye, hridoy diye hridi onubhob, aadhare mishe geche aar shob'. There is the inspirational 'Jodi tor daak shune keo na ashe tobe ekla cholo re'. Jibonando Das, the poet whose words represent the essence of everything that is concerned with the beauty of Bangladesh, simply mesmerizes, his words waxing eloquence and his poetry standing out for its love of the country as well as the language. 'Shuronjona, oikhane jeo nako tumi, bolo nako kotha oi juboker shathe, phire esho shuronjona, nokkhotrer rupali aagun bhora raate' symbolizes the plea of the lover who has been deserted by his lady love and is timeless for its acute portayal of a broken heart. To express his love for his homeland, the poet says, 'Abar ashibo ami Banglar nodi math khet bhalobeshe, jolangir dheu e bheja Banglar e shobuj korun dangay', meaning that he would be reincarnated again and again in different forms and remain in his homeland even after he dies. Bonolata Sen has been immortalized as the ideal Bengali woman to be, with 'Chul taar kobekar ondhokar bidishar nisha' (i.e. her hair is as deep as the darkness of the night). Kazi Nazrul Islam's words, on the other hand, are those adrenaline-pumping,penetrating slogans of unity that at once transform you from lethargic to vigorously energetic and have come to be associated with everything that the youtyh represents.With 'mohaproloyer ami notoraj, ami cyclone, ami dhongsho', and ' ami mrinmoy, ami chinmoy, ami ojor omor okkhoy', your blood starts boiling and you are ready for any task the world throws at you. With 'gahi shamor gaan, manusher cheye boro kichu nai, nohe kichu mohiyan' he tells you that no matter what one's class, religion or status is, everyone belongs to one religion and that religion is humanity. 'Bidrohi ronoklanto, ami she din hobo shanto, jobe utpiriter krondon dhoni akashe batashe ronibe na' sensitizes us to the plight of the wronged and the poor. These words immortalized by the three major poets of the language represent only a very small fraction of the beauty and elegance that characterizes our language, the language that many people gave their precious lives for. There are yet others who have adorned and enriched it with their thoughts and ideas, expanding and adding to it;and so continues the love affair with Bangla- as immortal as its existence itself.